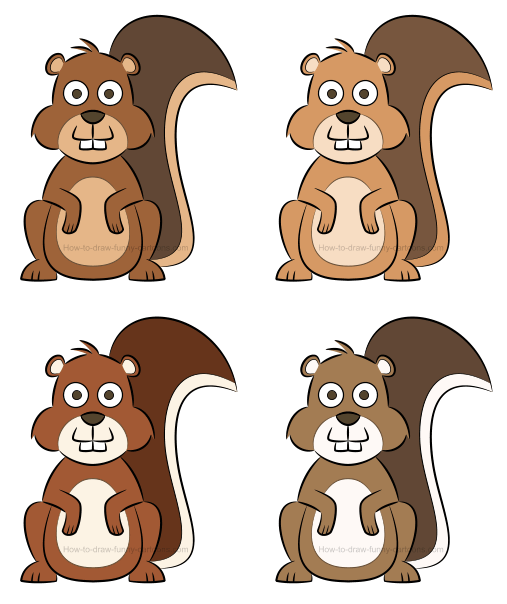 Create a funny squirrel using simple elements and then learn how to create more versions of the same character using various color schemes. Squirrels are adorable animals to draw and look at. Mostly made from long curved lines, these little creatures are known for being quick, agile and somehow wise for such an animal of this size. Before working on this character, it can be a good idea to take a few moments to see how this one is drawn. You can use the illustration above as a reference for this part of the tutorial. Hair is visible on top of the head of the cartoon squirrel. Ears are small and made from tiny curved lines. The tail is large and pointed near the end. A lighter stripe is located on the bottom of the tail. Cheeks are round and probably filled with food. A brighter patch can be found around the mouth. Arms and hands are done using straight and curved lines. Back legs are strong and large. Feet are flat on the bottom and filled with two small lines. A large patch is also visible on the stomach of the squirrel. More lines are added inside the hands. Teeth are made from rectangles drawn with round corners. The nose is small and made from a triangular shape. Eyes and pupils are done using circles. 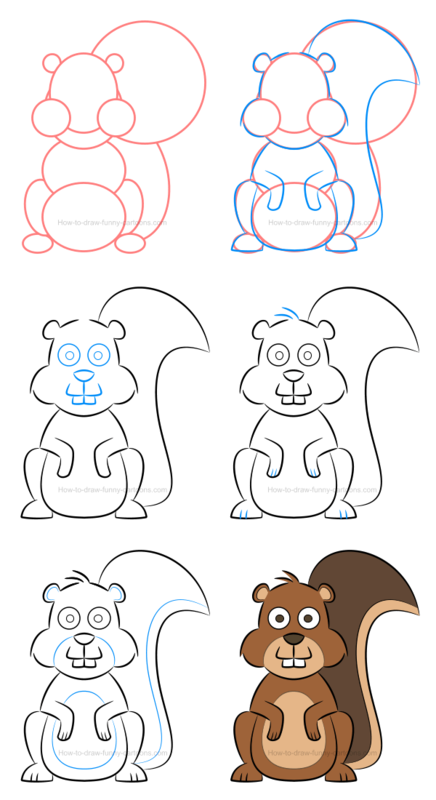 You can start this lesson by adding several circular shapes to create the squirrel. First, the head is made from two medium circles. 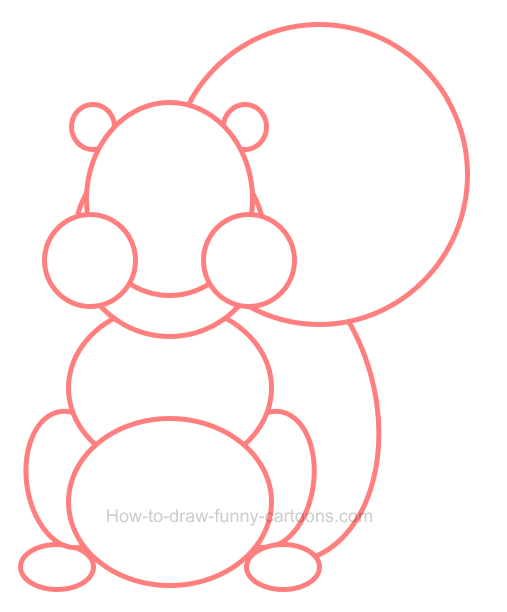 Then, you can draw small circles for the ears and larger ones for the cheeks. The body is made from two additional circles while the back legs are illustrated with oval shapes. Complete this step by drawing (very) large circles to represent the tail of the cartoon squirrel. step 2 - it's time to draw the animal! Using mostly short and long curved lines, you can now draw this funny squirrel as shown in the image below. Notice how the cheeks are made from two different lines to create hair and how the tail is large and impressive. Once you are done, you can erase all orange shapes created earlier. Inside the head, you can now sketch the eyes and the pupils using small circles. The nose is made from two lines that are placed in a triangular shape. The mouth is done using two lines and teeth are made from small rectangles. 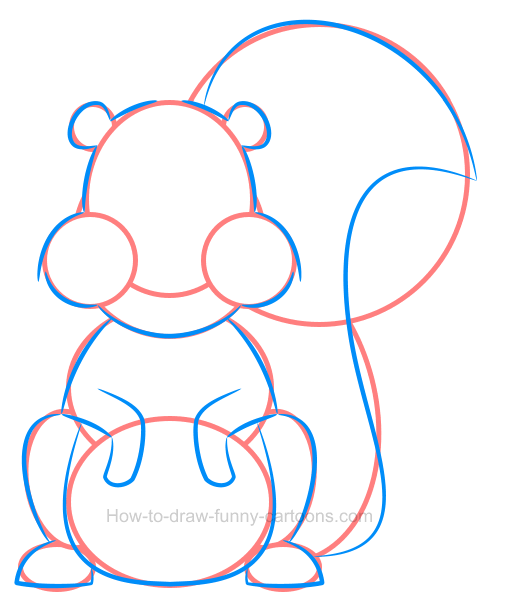 On top of the head of this funny squirrel, sketch two curved lines made with pointed ends. Then, you can add more lines inside the hands and the feet of the character. These details are subtle, but essential to create a lovable and appealing animal. A long curved line can be drawn inside the tail of the cartoon squirrel. You can also draw more lines inside the ears and around the mouth. One last patch is added on the chest of the animal. Good work! It's time to add some colors! 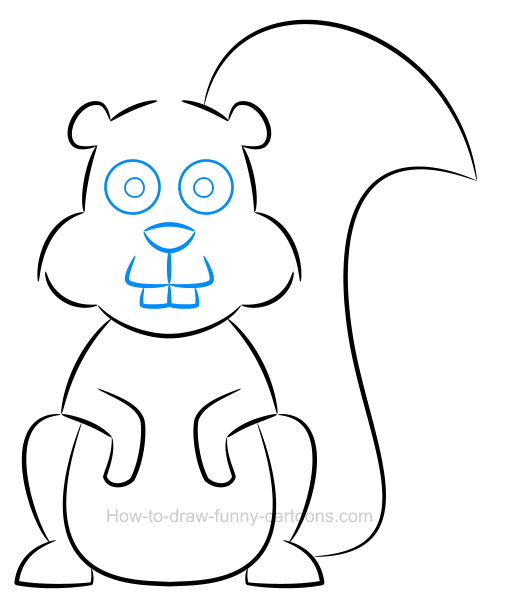 For this version of our funny squirrel, we can now add some brown colors all over the body. Make sure that the tail is darker, but patches found inside the ears, around the mouth, on the chest and on the tail must be brighter. The nose and the pupils can also be filled with a dark brown color. 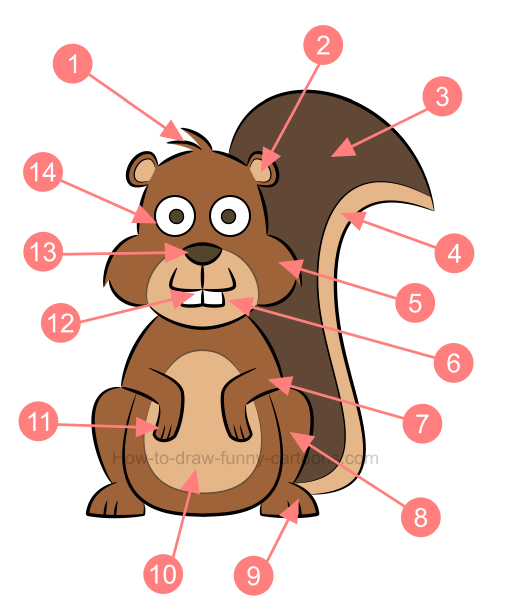 Six steps are required to create our friendly squirrel. The most complex step (and the most crucial one) is the first one. Getting all proportions accurate can be difficult and placing these shapes correctly is a real challenge. Once this step is done correctly, drawing the animal should be easier. Let's try a few alternatives using the same illustration, but filled with different colors. 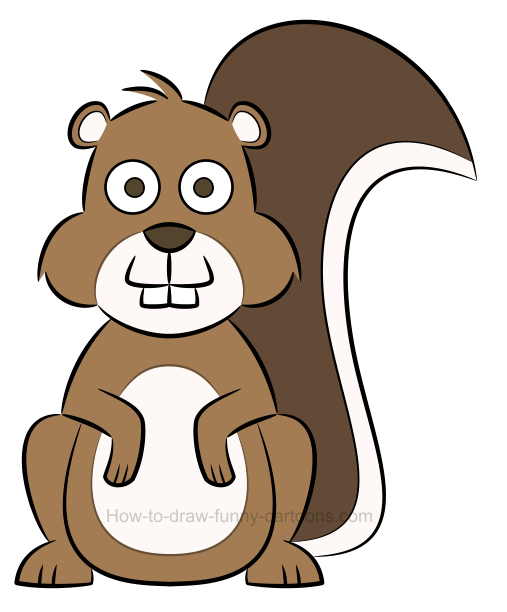 For this first attempt, the squirrel is filled with a brighter version of the original color. All parts of the animal like the tail, the body and the patches are lighter. It's an interesting approach, but the original version was prettier. In this second scenario, the character is filled with a dark brown color on the entire body and tail. All patches are much brighter (in fact they are almost white) while the nose and the pupils are still dark. That's an interesting approach compared to the previous version. A greenish character compared to the previous ones. In this final version, the character is now filled with a brown color that is also quite green. Patches are now virtually all white and the tail is darker compared to the body. This is an interesting illustration that is quite different from the others. 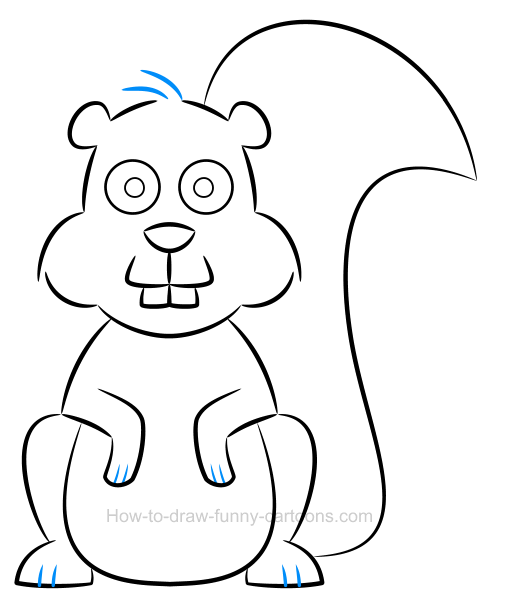 Nice work creating a funny squirrel like this one!